(c)	As both personal and impersonal because the Divine is ‘All-Existence’. 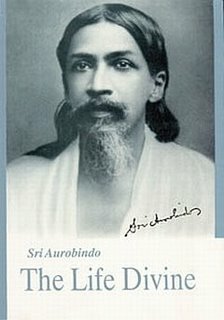 Sri Aurobindo’s description of the Supermind principle provides the metapsychological basis of the Impersonal and Personal poises of the Divine. The comprehending principle of the Supermind deals with the impersonal psychological truth of the divine consciousness. This is because it reflects the INDIVISIBILITY of the Absolute Consciousness where Existence, Consciousness-Force and Bliss are inseparably linked though bearing the potentiality of differentiation. The Knower, the Knowledge and the Known are not different entities but fundamentally one. The indivisibility of the comprehensive Supermind contains the multiplicity of creation without deviating from its own unity. To the student of the Indian classical spiritual tradition, a valid query arises : What would be the difference between the indivisibility of the Sachchidananda Consciousness and the indivisibility of the Comprehensive Supermind Consciousness? In both Sachchidananda and the comprehensive Supermind consciousness, Existence, Consciousness-Force and Bliss are inseparably linked. But in Sachchidananda, the indivisibility is ABSOLUTE and there can be no creative movement. Sachchidananda can be conceptualized as a ‘ABSOLUTE’ or INFINITE consciousness. The comprehensive Supermind consciousness holds the creative vision like a ‘in-built’ program and the apprehending Supermind Consciousness engineers that pre-programmed creative movement to fruition. Hence the indivisibility and unity of the comprehending Supermind is modified and not absolute like that of Sachchidananda. It is interesting to note that as the term ‘God’ is traditionally ascribed to the ‘Creator’, the creative Supermind does justice to that concept rather than Sachchidananda that is beyond creation. At the level of the mind, the creation blossoms in multiplicity, epitomizing ‘individualization’. The sense of unity is lost in essence so that individual forms can be unique with maximum utilization of potentials. One can understand this movement of unity to multiplicity by considering the relation between the ‘tree’ and the ‘seed’. At the level of the mind, the ‘tree’ and the ‘seed’ are two distinct entities though one is related to the other. The tree grows from the seed and the seeds are produced from the fruits of the tree and they go and complementing and fulfilling each other. At the level of Sachchidananda, neither the tree nor the seed exist. It is a Consciousness that surpasses all cognition. At the level of the comprehending Supermind, the seed-tree phenomenon is present as a creative essence. That essence not only holds the creative ‘idea’ but also the necessary ‘force’ to make the idea effective. Moreover, there is also the ‘law’ that is needed so that ‘idea-force’ can blossom in a field that has the milieu conducive for the blossoming. Such a field will be provided by Time-Successions and Space-Divisions. ‘This indivisibility of the comprehensive Supermind which contains all multiplicity without derogating from its own unity, is a truth upon which we have always to insist, if we are to understand the cosmos and get rid of the initial error of our analytic mentality. A tree evolves out of the seed in which it is already contained, the seed out of the tree; a fixed law, an invariable process reigns in the permanence of the form of manifestation which we call a tree. The mind regards this phenomenon, this birth, life and reproduction of a tree, as a thing in itself and on that basis studies, classes and explains it. It explains the tree by the seed, the seed by the tree; it declares a law of Nature. But it has explained nothing; it has only analysed and recorded the process of a mystery. Supposing even that it comes to perceive a secret conscious force as the soul, the real being of this form and the rest as merely a settled operation and manifestation of that force, still it tends to regard the form as a separate existence with its separate law of nature and process of development. In the animal and in man with his conscious mentality this separative tendency of the Mind induces it to regard itself also as a separate existence, the conscious subject, and other forms as separate objects of its mentality. This useful arrangement, necessary to life and the first basis of all its practice, is accepted by the mind as an actual fact and thence proceeds all the error of the ego. Is the Comprehensive Supermind the Impersonal God? If ‘God’ is the name used for the creator, than ‘Supermind’ as a principle fulfils the criterion. To use the term ‘impersonal’ for Sachchidananda is easier, for Sachchidananda does not ‘create’ and hence is truly ‘impersonal’. But if the creator who fashions ‘personal’ forms is considered to be ‘impersonal’- without personal attributes - then the ‘comprehensive Supermind’ provides the metapsychological foundation for such a concept. Why? Because the comprehensive Supermind reflects an indivisible unity though holding the potentiality of creation. ‘God’ is a concept invested with ‘unity’ or else there will be no harmony in creation! Surpassing measure, change and circumstance’.